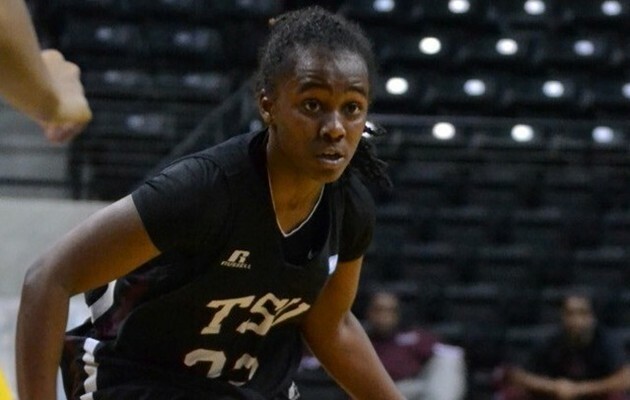 GRAMBLING, La.- The Texas Southern Lady Tigers defeated Grambling State in a nailbiter on Monday night winning by a score of 59-58. TSU (14-9, 11-1 SWAC) won their eleventh consecutive game and moved into sole possession of first place in the conference. Freshmen sensation Brianna Sidney tallied a game high 21 points on a 8-of-15 shooting night from the field. Kayla West contributed 14 points and Brianna Sidney nearly tallied a double-double with 11 points and 9 rebounds. Grambling State raced out to an 8-0 advantage but the Lady Tigers quickly responded as they settled down and began to run their offense. TSU took their first lead of the game at the 4:49 mark of the first half at 22-21 on a successful Te’era Williams free throw attempt. TSU led 33-23 at intermission. After watching the Lady Tigers go up by as many as 15 points in the second half Grambling State attempted to mount a comeback but the Lady Tigers held firm defensively holding GSU without a shot attempt in the games’ final seconds. Texas Southern finished the game shooting 41.8 percent (23 of 55) while holding Grambling State to just 38.6 percent (22 of 57). Williams scored 9 points as she went 3-of-7 from the field. Texas Southern outscored Grambling State inside the paint 32-26. The Lady Tigers scored 21 points off of Grambling State turnovers. Williams led all players in minutes played logging a complete game at 40 minutes of play. Simmons had an efficient night from the floor (5-10) as she was a spark plug for TSU’s offense. As a team Texas Southern dished out 12 assists with Williams leading the pack contributing a total of five. Texas Southern will host Arkansas-Pine Bluff on Saturday February 16 at the H&PE Arena at 11:00 am. The Lady Tigers will play the second installment of a two-game home stand on Monday, February 18 versus Alabama State at 5:30 pm. The Lady Tigers have won a school record 11 straight contest dating back to January 4th. *The Lady Tigers tied the school record for wins in a season (14) with their win against GSU. Brianna Sidney lead the Lady Tigers in points scored for the seventh time this season. Texas Southern Head Coach Cynthia Cooper-Dyke needs only six more victories to reach 150 wins for her collegiate career.